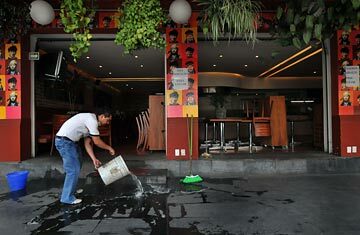 Mexico eagerly awaited the resumption of normal business at the end of a five-day swine flu nationwide shutdown. China and Swine Flu: Are Mexicans Being Singled Out? The mariachi bands and their tunes of past glories were deafeningly silent; the dances of women in handmade red dresses nowhere to be found; the reenactments by men dressed as tunic-clad soldiers notably absent. For the first time in 147 years since a small band of Mexican forces defeated the French imperial army, Mexico cancelled popular fiestas of Cinco de Mayo to avoid revelers spreading the deadly swine flu. Finance Minister Carstens also unveiled an economic recovery plan, promising $1.3 billion in grants, loans and programs to hard-hit sectors. But such funds may not go far in an economy already in recession from the global slowdown. Businesses from the flu-ridden streets of the capital to the golden beaches that tourists fled in droves are all complaining they have been hammered by the epidemic and its consequences. In the Caribbean paradise of Cancun, six major resorts were to take their own holiday because they had been emptied of guests, said Rodrigo de la Pena, president of the Cancun Hotel Association. "This is the best action they can take to avoid having to lay off staff," de la Pena said. Pena hoped that the lack of tourists would last no more than three months. But others fear that few Americans or Europeans will be back tanning on Mexican beaches this year. Considering that foreign tourism gives Mexico $15 billion a year, total losses to the economy could be devastating. Hoping to avoid such a catastrophe, Mexico has been quick to condemn foreign governments that have suspended commercial flights, calling the actions discriminatory. In a televised speech, Calderon urged nations that have cut off plane routes to Mexico  including Argentina, Colombia and Cuba  to reconsider. "I ask all the nations that they stop taking actions that only hurt Mexico and don't contribute to stopping the spread of the disease," he said. "Mexico will fight this virus better in collaboration with the rest of the world." Officials in those countries claimed, however, that they don't have huge stockpiles of antiviral drugs and need to take any actions necessary to save their citizens' lives. The United Nations has spoken against such measures in general but has held back from condemning any individual countries for taking them. Restoring commercial flights and travel for Mexicans may well depend on how the virus develops. While the World Health Organization say that H1N1 is not as lethal as initially feared, it warns it can still put otherwise healthy young adults and older children into hospital with pneumonia. This effect has killed at least 26 people in Mexico, although the majority had deteriorated substantially before they were given antiviral drugs. Furthermore, while the number of new cases has dropped since late April when about 200 people a day were pouring into Mexican hospitals, there are still about 40 people a day being admitted to clinics for swine flu treatment. Mexico's big hope is that this number will not shoot back up as the nation gets back to work. "We cannot let down our guard," said Health Minister Jose Cordova. "This battle is far from over."